Public relations is the conscious organisation of communication. Public relations is a management function. The task of public relations is: To achieve mutual understanding and to establish beneficial relationships, between the organisation and its publics and environment, through two-way communication. * Events – group communication: Different events, presentations, exhibitions, seminars, conferences, congresses etc. 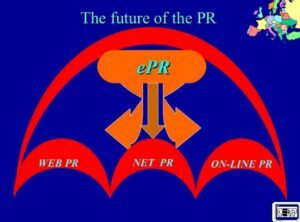 What is ePR, electronic public relations? ePR includes all forms of communication, where the participants communicate electronically, internal (intranet) or external (Internet). * The co-ordination of behaviour. The co-ordination between the organisation and the public and the public and the organisation, through interactive dialogue. We could speak about the ePR only if the above three criteria exist simultaneously. The new information and communication technologies have opened up totally new communication channels for pr practitioners on the field of public relations. The ePR is one of the most effective tools of direct communication, not only in business but also in wider society. ePR is a tool to reach and communicate with new and existing partners. From a public relations standpoint, the web provides an excellent opportunity to distribute information to the public speedily, efficiently and cost-effectively. Net PR includes chat rooms, e-mail (Net) Press Releases and the use of interactive Intranet. * Virtual organisations, Job finder etc. > On-line press room: Media only section of the web site or dedicated site. What is the future of public relations? Access to information is now demanded as a right: The days of limited access and push communication are over. In every field of public the pr experts collect and send information they want to be available, simultaneously with the birth of information. The challenge for further relations’ pr practitioners is to use the new Information communication technology tools to satisfy the demand.